Your opinion matters. 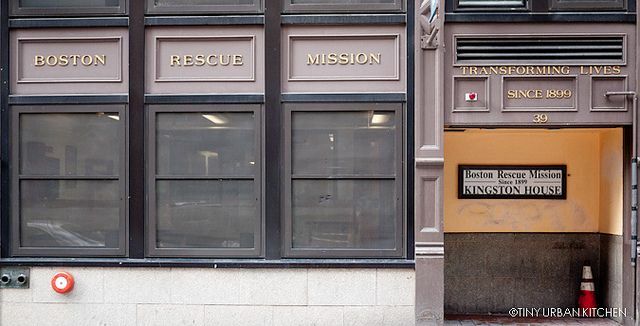 Leave your review of Kingston House - Boston Rescue Mission. Our year-round Safe & Healthy program members receive a nightly meal, bathroom and shower facilities, and breakfast before departing in the morning. Members also may speak with a case manager who may suggest further recovery programs, depending on the individual's needs. Nurses and a doctor are available thanks to a partnership with Boston Health Care for the Homeless. During the chilly winter months, our emergency shelter hosts people who don't have a place to sleep. Participants arrive in the evening, are screened for safety, and receive meals, shower facilities, and safe beds out of the cold. Guests leave in the morning, but may return the next evening if needed. This program generally runs between November or December through April, and is renewed on a yearly basis depending on the availability of state resources which anchor the program. Substance abuse is clearly one of the leading causes of homelessness and must be addressed in any prevention strategy. Unfortunately, recovery for individuals with limited financial means usually consists of a three to five day detoxification program provided by publicly funded insurance and a return to their typically unstable pre-detoxification living situation. This "recovery" is clearly inadequate, and many of these individuals soon revert to substance abuse and again put themselves at risk of becoming homeless. Each year, our recovery program provides hundreds of recovering alcoholics and addicts with a safe and therapeutic environment in which they can address their substance abuse issues and ultimately achieve a healthy, self-sufficient living situation. The program begins when a program member is referred by a licensed detoxification program. The referred program member is assigned to an individual case manager who conducts a careful and extensive evaluation to assess the program member's mental health and vocational, legal, cognitive behavioral, housing, medical, family, recovery, educational, and other needs. The case manager then develops an individualized care plan for the program member that is implemented through daily twelve step meetings. Over the course of the program, case managers and training sessions provide program members with substance abuse treatment, mental health services, anger management treatment, employment assistance, job training, housing assistance, and financial management assistance. In addition, program members participate in classes on living independently, repairing broken relationships, and improving social skills. The goal of these sessions is to build program member self-esteem and equip them with the tools and skills they need to achieve permanent self-sufficiency. All program services are provided without monetary commitment from program members. This provides an opportunity to save money, including provisions for outstanding legal obligations. Instead, program members are asked to participate in community service projects that contribute to the health and well-being of their treatment environment. This provides a structured environment for each of our program members, which is an essential ingredient to the success of any recovery program. When a program member is ready to embrace independent living with a community-based support network, graduates are provided with detailed discharge and aftercare planning. Case managers track and monitor the program member's progress after discharge. Formalized aftercare services are offered at Boston Rescue Mission as well as through informal relationships that have been formed through the treatment process. Graduates are welcome to utilize the Boston Rescue Mission for vocational training, employment assistance, housing assistance, or any other services on their journey to establish an independent and supportive housing environment. This fall, the Boston Rescue Mission launched an exciting new opportunity to support downtown Boston’s community of recovering alcoholics and addicts - the Sober Living program. Adult men with 30 days of sobriety can complete a short screening procedure to determine eligibility and enter the Kingston House as a member of a sober community. Like other sober communities, members abide by certain house rules to ensure safety and sobriety and pay a nominal weekly fee as a commitment to the program and to support the cost of their living space. 1. A centrally located and convenient downtown location is a huge plus for many program members, who can find and access places of employment and transportation options easily. 2. Members' fees include all meals. Because the Mission serves so many people each day, it’s easy to include Sober Living members, and it saves a lot of money for members. 3. Members have access to in-house group recovery meetings, case managers, spiritual development and many other resources available to residential recovery program members. Since many Sober Living members have recently graduated from a recovery program, these in-house resources are very attractive to potential members. The Mission sees the Sober Living program as a natural extension of our residential recovery program to fill a critical need in the recovery community of downtown Boston. We appreciate your prayers and support through the launch of this exciting program. 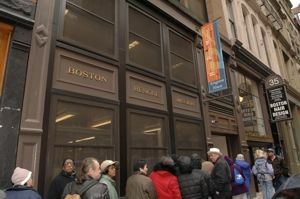 The Boston Rescue Mission is accessible by the Red, Orange and Green Lines. Take the Red Line to the Downtown Crossing stop. Go up the Chauncy Street Exit. You will be at the intersection of Chauncy and Summer Street (by the CVS Pharmacy). Walk down Summer Street one block with CVS on your right and take a right onto Kingston Street, we are located 3/4 of the block down Kingston Street on the right side at 39 Kingston. Take the Orange Line to the Downtown Crossing stop. Go up the Washington Street exit. You will be directly across from Macy's. Walk down Summer Street with Macy's on your right. Cross Chauncy Street, passing the CVS Pharmacy on your right, and take a right onto Kingston Street. We are located 3/4 of the block down Kingston Street on the right side at 39 Kingston. Take the Green Line to the Park Street Station. Cross over Tremont street and walk down Winter Street. Continue down Winter Street/Summer Street (Winter Street turns into Summer Street) Walk down Summer Street past Macy's on your right, cross Chauncy Street, passing the CVS Pharmacy and take a right onto Kingston Street. We are located 3/4 of the block down Kingston Street on the right side at 39 Kingston. Do you have items to donate? Contact Kingston House - Boston Rescue Mission at the phone number provided above to see if they can use any items you may have to donate.